We got an apartment in Brooklyn!! Long story REAL short: it took a month and a half. The housing requirements with most brokers/agencies are quite challenging. First we stayed in a sublet, then we stayed with friends (our hero’s!) – and here we are…home. Greenpoint, Brooklyn, NY. I wish I could articulate how equally it exudes both BITTER and SWEET. Discoveries happen every day. Change is nothing to be afraid of. You just have to remember, everything takes time. This little piece of land in the USA called New York City has so many faces. So much variety. It’s adventurously grand, yet overly crowded and dirty. There’s so many exciting things to do, but you’re often too tired to do them, ha. Oh, the irony. I’m hopeful that our level of sleep deprivation will improve once we get more settled. I’m blogging from our new bed that was just delivered from IKEA yesterday. The rest of the apartment is empty. Including the kitchen cabinets. No pots or pans for cooking yet. It’s so funny how you take things for granted – like the fact that plastic knives will not get peanut butter out of the bottom of the jar. It just won’t work, no matter how hard you try. Nonetheless, I made a delicious brunch for Andy last week, whilst we were still staying with our friends. Mel let me use her little kitchen whenever I wanted. She is the best. 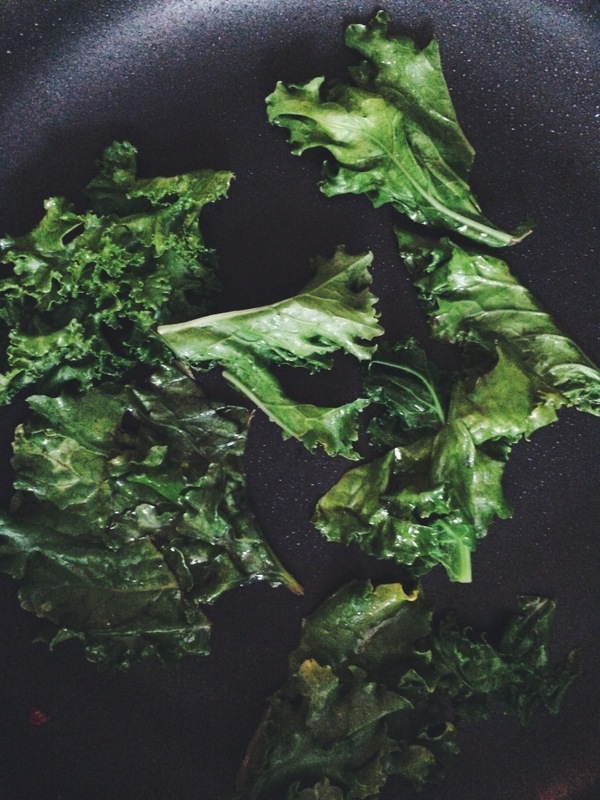 In a skillet, sauté some kale, picked from the thick stem. I used grapesee oil, salt, pepper, and garlic. 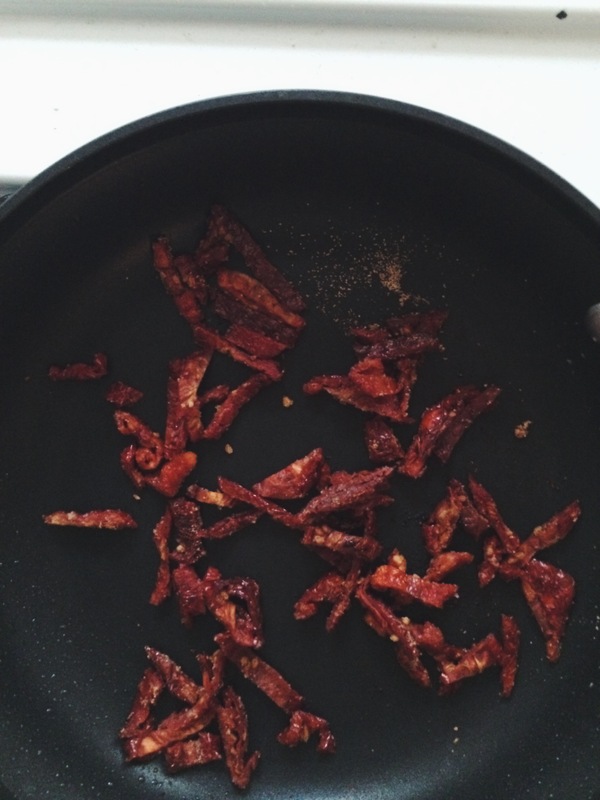 Don’t sauté too long or it’ll be quite wilted. Keep a little crunch. 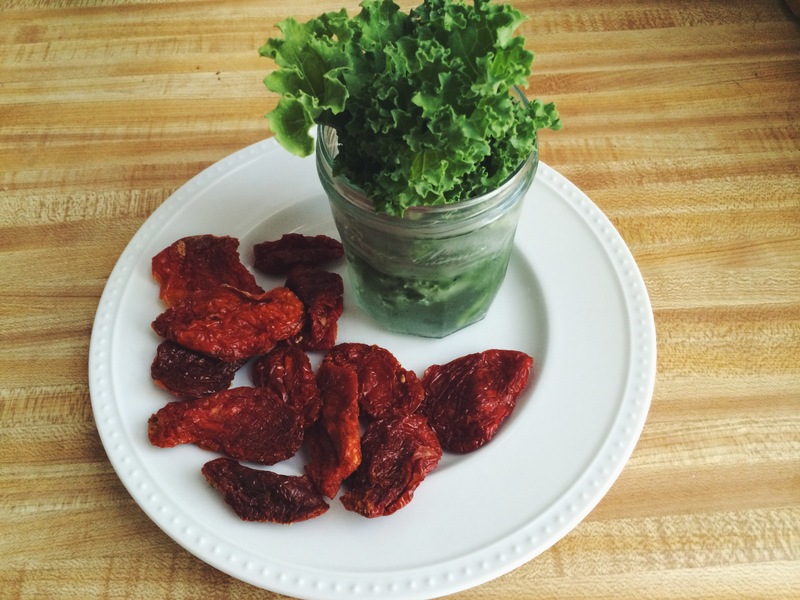 Chop fresh sun dried tomatoes (the big dried ones – they are perfectly sweet, tangy) sauté them with garlic for a few minutes as well. Poach two eggs. Cause it’s only the best way to eat an egg:) It’s helpful if you dry them off once they’re removed from the boiling water. 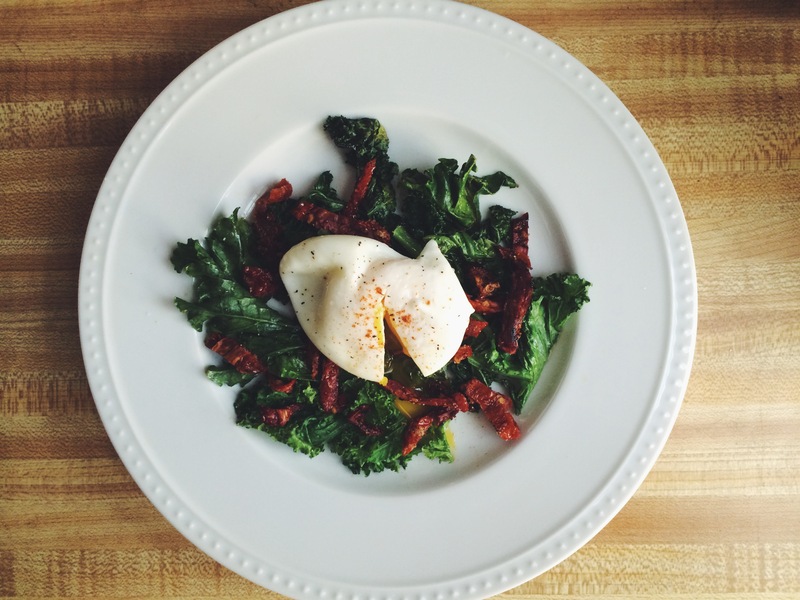 Layer your plate: a bed of kale, sun dried tomatoes, a slice of canadian bacon/turkey bacon/regular bacon, and your two poached eggs. 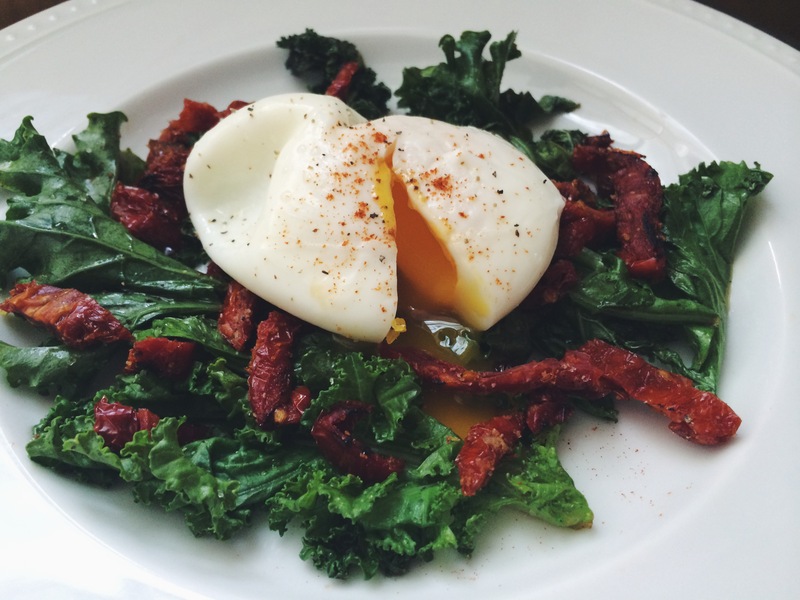 Add a pinch of paprika salt and pepper and you have yourself some Poached Eggs, Brooklyn Style. My photos are void of bacon, only because I did not have any at the time. But DO IT. My fav is turkey bacon and although I get judged for that, I’m not shy about it. I miss you, Glorie! (And Andy). I am so happy you have a place to call “home.” Thank you for the entry!